1. Please Peel Off the Protective Films on the Top and Buttom Layer before you assemble it. 2. This 9 layers computer case is not compatible with Asus Tinker Board and Libre Board. 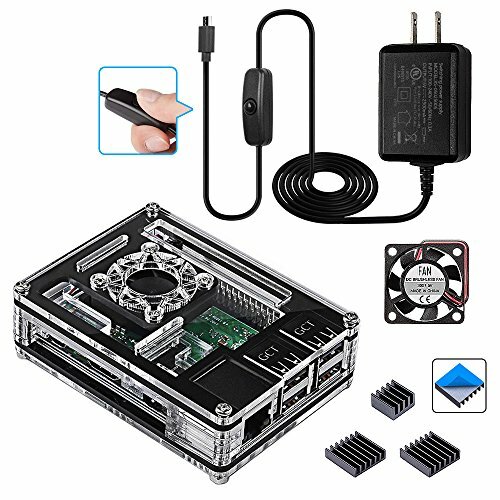 Case fits for Raspberry Pi 3 Model B+ (Latest Version) - Specially design for the 2018 new Raspberry Pi 3b+. Fans & Heatsinks Cooling - DC 5V quiet fan and 3pcs Aluminum heatsinks to cool down the pi 3b plus. Smraza Upgraded 2.5a raspberry pi power supply - Output 5V DC 2.5A Regulated, safe to use. Convenient to control pi - 59 inch power cord w/ on off switch, easy to power on the pi. Allow all GPIO ports access - 9 layers Acrylic case(come with metal screws) w/ accurate cutout for GPIO ports.